Millie IV's Story . . .
Update 01/02/2014: "Being with her people is one of her greatest joys." Millie came back to MAESSR through no fault of her own after spending the past three years living very happily in her first MAESSR home. Unfortunately her adoptive father developed some health problems and was unable to provide the exercise that Millie required. Since he wanted only the best for his sweet girl, he made the tough decision to return her to MAESSR in order to find her the home she deserves. This well-behaved girl is loving with people of all ages. She doesn’t care to share her home and toys with other dogs, so she would be best as an only dog in her new home. She has attended doggie day care where she got along well with the other dogs, even engaging in playtime. At the dog park, she tended to stick close to her owner to make sure other dogs didn’t approach him. 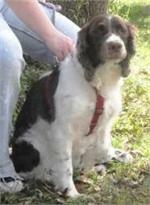 Millie is housetrained and has complete run of the house. She has been crate trained and does use one regularly at day care. She is reported to be very well behaved with the groomer and loves to be brushed. Riding in the car is something Millie loves to do. She prefers to ride shotgun but will go into the back with a little coaxing. Since this smart girl knows how to lower the car windows, it’s important for the driver to engage the lock! A good watchdog, Millie will bark to alert her people of someone’s approach, but calms down quickly when directed to do so. She’s initially a bit shy when someone new comes to visit but warms up quickly and wants to be right in the middle of the action. Being with her people is one of her greatest joys. She was allowed to spend time up on the furniture for evening snuggling and on her owner’s bed at nighttime, although she would hop down after a while to sleep solo. Millie is not a counter-surfer and will not touch food left on a low table. It’s best to keep the trash covered, however, as she will investigate good smells. At her humans’ mealtime Millie will sit closely by the table. Her steely gaze is directed towards the food with the hope that it initiates some sharing. Millie loves to play with her toys and will entertain herself. She loves to play tug-o-war with whatever toy she has at the time. Although she fetches a tossed ball, she has never caught on to bringing the ball back to repeat the action. Millie LOVES the water and will swim for hours. She’s a good girl in the bath but prefers water of her own choosing be it a pond, pool, or ocean. This sweet, independent little girl would make a very loving companion in a one dog family. Are you looking for a new best friend? Original: "When she got to her foster home, the resident grumpy dog took one look at this petite girl and fell in love." Millie came to MAESSR because she and the older female dog in the household were no longer getting along. 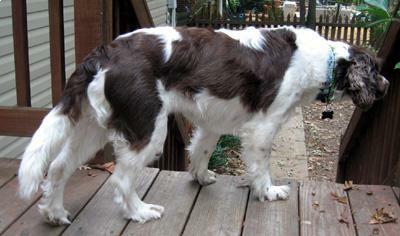 It was decided that because Millie is younger, she would be more adoptable. Her owners took her to a Pennsylvania shelter and there MAESSR stepped in. Just as the MAESSR Transport Team has Springer Air, there is Springer Freight Lines, too! A transport volunteer is a long-haul trucker and he gave Millie a ride in his 18 wheeler to her foster home in Virginia. She did very well with the ride, settling in with the other dogs accompanying him. When she got to her foster home, the resident grumpy dog took one look at this petite girl and fell in love. Millie, on the other hand, was evidently thinking, "Who is this geezer?" She ignores him despite the fact that he follows her slavishly. The only fight between them occurred over a toy, so now Millie's foster mom is very careful to play with them separately. They eat near each other with no trouble, though. Millie did want to chase the resident cat but was told: NO! The cat is not to be touched! It was good that Millie wants to please and she quickly learned the "No Chasing the Cat" rule because on her second day at her foster home, she went after a squirrel and got it! As her foster dad went out to dispose of the carcass, he said that it was okay since squirrel season started on Sept. 4th in Virginia. Very well behaved in the house, Millie has proven trustworthy and so is not crated or gated when her foster parents are out. She would love to be on the furniture but gets off with good grace when told to get down. She would also love to sleep on the bed but is becoming resigned to sleeping on the floor on her comfy dog bed. Inside the house she is quiet, but outside, she is very active and will pull on the leash when being taken on a walk. 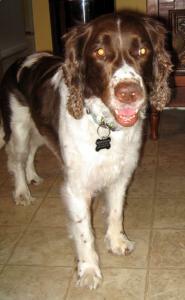 Like all Springers, Millie loves most of all to be with her people! 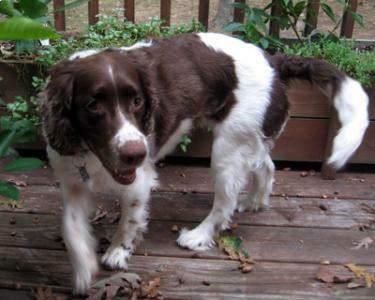 Millie would do well with an active family that loves to go on walks and have fun outside.